How will the aftermath of Hurricane Harvey impact the logistics industry in the short and long-term future? On Friday August 25th, Hurricane Harvey made landfall in Texas. It was the biggest storm to hit the United States in over a decade and is projected to be one of the most devastating storms of all time. As much as sixty inches – five feet – of rain is expected to have fallen before the storm moves away from the Houston area. We here at AFP Global Logistics are praying for the victims of this massive disaster. Hurricane Harvey and its aftermath are already having a major impact on transportation networks in Houston and the surrounding areas. Nearly 10% of US trucking is expected to be affected by Harvey this week, with slight declines over the next month or so. In all logistical areas, the road to rebuilding infrastructure is projected to take a very long time – some experts are cautioning that it may take several years to fully rebuild. Currently, operations are at a stand-still – roads are blocked, equipment and infrastructure is severely damaged, business is shut down, and much of Houston is deep under water. This storm will radically alter transportation logistics nationwide at a time when capacity is already straining to keep up with demand. Combine capacity shortage with the Labor Day holiday weekend in the short-term and the impending holiday season in the long-term, and you can see that there’s a storm brewing in the logistics industry. Here are some of the immediate impacts of Hurricane Harvey (as of today) which carriers and shippers will need to keep in mind. Carriers have reported that the storm is having a major impact on their ability to safely get in and out of southeastern Texas. Flooding is, of course, the major obstacle in this regard, but there are also road blocks to navigate as well as the closure of logistical hubs and the significant reduction of personnel in any facilities which have remained open. Here’s how the various areas of transportation logistics have been handling the impact of the hurricane over the course of this week. Truckload: Carriers have put their emergency contingency plans in place, working within limitations as set by the local authorities. Due to road conditions and the sheer area affected by Harvey, all non-essential travel has been banned. Many truckload carriers have ceased operations fully or have limited their services due to their loss of assets. LTL: Southeastern Texas continues to experience system-wide disruption, and these shocks have impacted transportation in the entire state. The storm has caused an influx of cargo that carriers need to deal with. They anticipate that service in and out of the region will be interrupted for quite some time. Warehousing/Bulk Storage: Warehousing and storage facilities in the Houston area are completely shut down and are currently not accepting any inbound freight. Due to the road closures and massive flooding, facility personnel have been unable to report to work. This will have a broad impact on transportation networks nationwide since there will be a limited number of trucks arriving from Texas for loading in other parts of the country. Rail Networks: While railways are open, road conditions are preventing access to facilities. Customers should expect delays on these rail networks due to the lack of personnel available to report. Loading and unloading has been suspended and officials only advise emergency-related travel. Ports: Port traffic will be allowed into southeastern Texas when the Coast Guard deems the ports safe. Some of the ports may end up reopening earlier than others, but in every case the Coast Guard will complete a thorough assessment of the areas before reopening them to vessel traffic. What Should Shippers Expect and Do in the Near Future? The impact of Hurricane Harvey on our logistics network cannot be overstated. For starters, the Gulf Coast of Texas accounts for about half of all US petroleum and gas exports and is home to major gas and oil companies such as Exxon Mobil and Valero Energy. We have already begun seeing oil prices jump, so drivers should expect their fuel costs to increase. Spot rates are also expected to spike during the coming days. 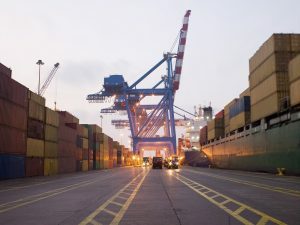 As logistics companies pitch in to help with humanitarian relief efforts, total cargo capacity will be tightened and prices are expected to rise for shippers because of it. And due to the loss of facilities in southeastern Texas, extended transit times will be the norm in the short-term. What can shippers do as relief efforts are underway and the city of Houston begins to rebuild? Expect delays of at least 2-3 days going forward. If you have the opportunity to choose an alternative route, this may help alleviate those delays. If you have some freight that has to move into a given area, prioritize your loads based on need. Capacity is tight and you may have to look at alternative modes of transport to get your goods where they need to go. For some areas, truck, rail, or even air transportation may be a good idea. AFP Global Logistics will continue to monitor the impact of Hurricane Harvey and is committed to delivering superior service to our clients during this difficult time. For any and all of your freight shipping needs nationwide, look no further than AFP Global Logistics. We provide a full range of shipping and logistics services, and our 25 years in the business have given us the tools we need to create customized logistics solutions that are tailored to the needs of each client we serve. We have what it takes to provide the superior shipping and logistics solutions that your business needs to thrive. For more information or to start designing your own logistic solutions today, get in touch with AFP Global Logistics at 410.590.1234 (toll-free 800.274.1237), email us at info@afplus.com, or fill out our quick and easy contact form here! This entry was posted on Thursday, August 31st, 2017	at 2:18 pm	and is filed under News	. You can follow any responses to this entry through the RSS 2.0	feed. Both comments and pings are currently closed.